Each of our mouse pads are proudly made in the USA at our Scottsboro, Alabama facilities with sharp, colorful graphics. The pads measure 9" in width by 7 3/4" in height and are 1/4" thick. This 101st Airborne Division Security mouse pad features Staff Sgt. 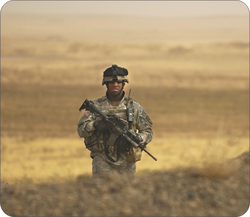 Emanuel Walls, from 2nd Platoon, Company A, 1st Battalion, 327th Infantry Regiment, 101st Airborne Division, keeping an eye on the terrain surrounding Namla village, Iraq, while his platoon monitors a traffic control point. Photo taken November 2, 2005 by Tech. Sgt. Andy Dunaway and is courtesy of the U.S. Army.